Simple ways to turn your early start into the best part of your day. It’s winter and it’s dark, gloomy, and we’re all feeling a bit ‘meh’ and the thought of getting out of bed in the mornings. I’m not a morning person, as I’ve mentioned in the past. Not at all. Like so many other people I find it much easier to get up and going in the summer but right now the cold, wet, dreary British weather just makes me want to curl up in a ball under my duvet with my cat and not move a muscle all day but that’s hardly practical at the best of times. How to become a morning person? 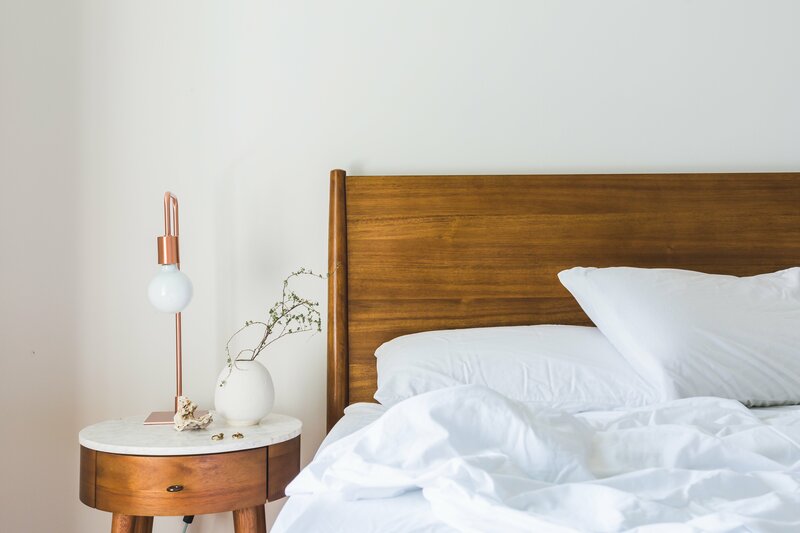 It all sounds really easy in theory, but when it comes down to it so many of us just hit that snooze button and roll over rather than getting up and starting the day the right way. But there’s one thing I’ve done to make me want to get up, no matter how dark it might be outside or how cold my house is (it’s like an igloo, seriously) and it’s something you can do very easily, too. Make your morning something to look forward to. I actually look forward to getting out of bed these days, something I never thought I’d say. But there’s something revitalising about getting up and getting started early, knowing that I have more time to get things done and time to enjoy things like having breakfast and playing with the dog rather than rushing about at the last minute and scoffing down a mouthful of toast on the way out of the door. I’m not a saint: not every morning is blissfully calm with no rushing, no moaning about my bed not letting me go, but more and more these days I’m bouncing out of bed with a smile on my face – and you can, too! Not everything on this list will be relevant to you, but hopefully at least a handful will help you get on your way to being that morning person we all have in our house/office/life. Start the night before. Have a good routine and good sleep hygiene (read more about that here). Put your phone or alarm clock somewhere out of reach. Either across the room or just somewhere where you have to get out of bed (or at least sit up and reach) to get it. You’ll be less likely to crawl back under the duvet once you’re up. Have one alarm. Yes, one – a daunting thought to people like me who have a chronic fear of oversleeping. But you’ll get used to it after a day or two, and it’s so much healthier than constantly hitting snooze and dozing until the last minute. Have a sweater, dressing gown, socks and/or slippers ready to throw on. Yep, it’s cold. So have some cosy clothes to hand. Make these your favourites, too. I have these slippers from Next and they are the cosiest things ever, I rarely have them off my feet when I’m in the house. Decide what drink is your go-to first thing in the morning. Mine is a strong coffee with one sugar, made with frothed milk. I’m a big fan of splurging on coffee and coffee machines (yep, coffee snob in the house) so I have my Nespresso machine to thank for my morning coffees. But maybe it’s tea, an espresso, a hot chocolate, juice, whatever it is make sure you have it in the house and to hand in the kitchen. Plan a good breakfast and prepare what you can the night before. Not only is eating breakfast healthy, but you’ll look forward to getting up and eating whatever it is you’ve got on the menu. I have a fledgeling Pinterest board of breakfast ideas right here if you want to give it a follow. Following on from the above: find a favourite mug and make that your morning mug. Set it out the night before. Nothing feels better than drinking your favourite beverage from your favourite mug, right? Give yourself a reason to get up. Work? Gym class? Dog to walk? If you have somewhere to be at a certain time, that will spark the need to be up and ready to go. Have one clock that doesn’t read the right time. My Fitbit thinks it’s four hours in the future and I can’t work out why, but that isn’t what I’m getting at. The clock in my car is a few minutes fast on purpose, so that whenever I check the time it makes me feel good for being on time – when I’m actually early. Do less from your phone. Don’t lie in bed checking your emails, do it in front of your laptop downstairs with a coffee in your hand. Don’t scroll through social media first thing (unless your job relies on it), wait until a morning break to do this. Have a shower and brush your teeth. Obvious, I know, but doing both these things will get rid of any dregs of sleep and leave you feeling refreshed. Pick out your favourite shower gel and use it solely in the mornings – you’ll start to associate the scent with the feeling of waking up and getting going. Wake up early at the weekend too. I know, weekends are supposed to be for lie-ins, and I do love a good lie-in. But life has been so busy that I’ve been up ridiculously early either for spin classes or to decorate the house, and I’ve got into that routine. Plan weekends you’re excited about, even if it just means a day of me-time. It won’t happen overnight. You won’t suddenly wake up tomorrow and be A Morning Person. It takes time to adjust to new routines and for your body clock to sync up with earlier rising. But with a few tweaks to your mornings and a bit of determination, anything is possible – including loving early starts! Louise Hudson is a Yorkshire-based writer sharing ideas on creativity, mental health, ethical living, and literature.